With most of the major Top End dry season multisport events now done & dusted, some of you will be able to kick back and relax for the weekend, or at least have a bit of a sleep in for a change! Still others will be training on for upcoming events including a big crew heading for Ironman 70.3 Sunshine Coast next month and our Juniors who have their next event happening on Saturday evening (see below). 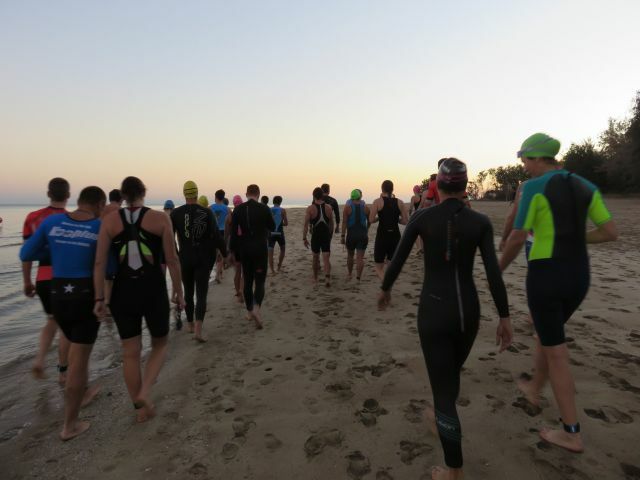 Our AGM will take place prior to our Open Water Triathlon on 30 August 2015 at Casuarina. 3. Any other business requiring consideration by the Club at the meeting. 4. There are no special resolutions tabled. 1. Nominations are being taken from members interested in filling positions on our committee for 2015 | 2016. 3. Don't be shy, we need to cover lots of areas including equipment maintenance, juniors, sponsorship, new event venues etc etc so do let us know if you are able to contribute. 1. Our next junior event takes place this Saturday 22 August 2015. 2. It's an exciting night time event - ride | run format - at Howard Springs Old Pine Forest. 3. 6pm start - warm up ride & course reccy; 6:45pm start; 8pm finish; BBQ & drinks afterward. 4. Mozzies should not be that bad, but no way to tell them to stay away completely so do bring some mozzie repellent. 5. LIGHTS: If any juniors/parents need lights for this event, Cycle Zone Darwin (6/41 Cavanagh St, opp GPO) are making available 100 lumen moon lights at special price of $30 (normally $65). Call in and mention that you are participating at this event to receive the special price. 6. Thanks Cycle Zone Darwin for supporting our juniors. 1. More listings on our DARWIN TRI - BUY | SWAP | SELL | WANTED Facebook page - ask to join to check them out. 1. Keys found near Cool Spot at our last event have been returned to owner (tracked down via social media), but not before he paid out $800 or so dollars for replacement keys. Ouch! 2. Run of back luck continues for Steve Goat who is now nursing a broken hand and other injuries courtesy of BMX tumble. Our speedy recovery wishes go out to Steve. If you can replace Steve as RD for our event on 30 August we would love to hear from you asap. 3. John McLean Foundation Kids4Kids & Big Kids for Kids Challenge - fundraising for JMF by doing an ironman distance over 12, 8 or 4 weeks. Start dates 5 Sept, 3 Oct & 31st Oct.
4. Graeme Parsons and Kylie Scholz are heading to Indonesia this weekend for Ironman 70.3 Bintan. Good luck! 6. Also heading overseas, Jim Eadie and Sarah Collins who will be competing at Ironman 70.3 World Championships in Austria on 30 August 2015. 7. Lining up this weekend as well, Tim Green at Tri Port Triathlon at Port Douglas, Qld. Good luck. 9. Don't forget to check out the Pointscore after each event. We appreciate hearing from you if something is not quite right.